Gary Borger is a noted fly tier, but he isn’t a fly purist. “There are literally hundreds of thousands of fly patterns and every one of them catches fish,” he says. 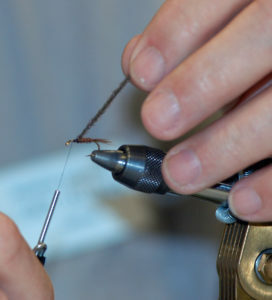 Only the patterns that work have survived in the literature or the re-telling between fishers after a day on the water. The huge variety of patterns also proves a basic fact about fish behavior, he says. Fish aren’t always selective. 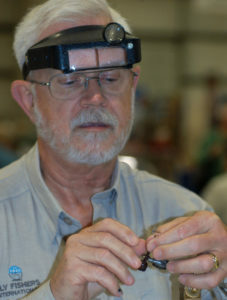 Chet Allison at work on a Pheasant Tail with the finished product at center right. 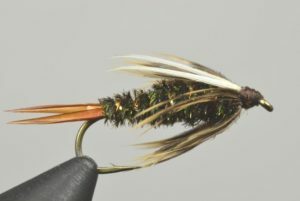 The pheasant tail is a universal nymph, says Borger. The Prince Nymph is another. Another universal pattern Borger likes is a hair-leg worm. 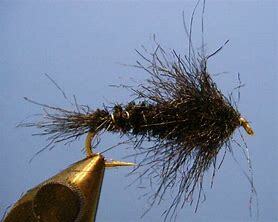 It can be tied to imitate small may flies, stone flies or dragon fly nymphs. 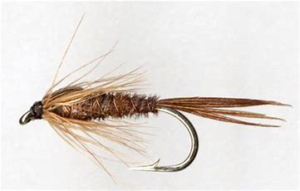 With a brisk retrieve it can also imitate bait fish like sculpin. Woolly buggers are also a universal design. 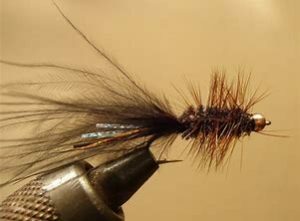 In fly fishing, we classify nymphs as any sub-aquatic invertebrate, including leaches which a wooly bugger imitates. 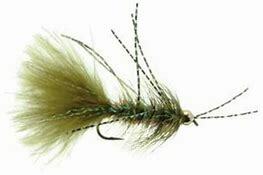 Borger regularly fished the pattern like nymphs below shot with an indicator to target large brown trout and steelhead around his Wisconsin home. Add rubber legs to the pattern and the possibilities expand again.